At the closed door of a grass hut a female diviner leans forward to talk to the occupants, a young married couple. The ceremony, known as gorot, was done to ensure that a child would be born to the couple even though she had been married at an early age, probably before menstruation. The Nuer believe that the payment of cattle for marriage in such circumstances may cause barreness unless a gorot ceremony is carried out. Other women at the frame edges evince the presence of onlookers and the fieldworker's position among them - it was difficult for Evans-Pritchard to raise the Rolleiflex high enough to avoid some obscuring either side, and his physical circumspection around the ceremony is thereby accentuated. Note on print reverse ms pencil - "4 gorok" & print front border ms ink - "NUER II/54"
Morton, Chris. 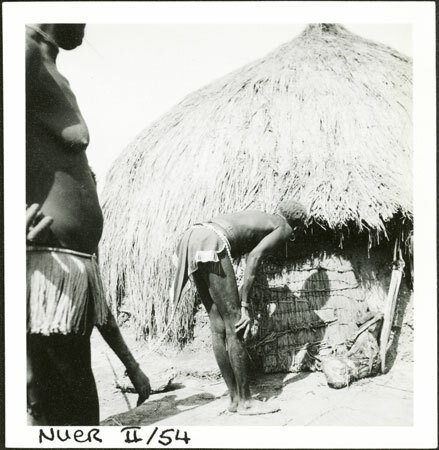 "Nuer fertility ceremony " Southern Sudan Project (in development). 03 Jan. 2006. Pitt Rivers Museum. <http://southernsudan.prm.ox.ac.uk/details/1998.355.76.2/>.